The chicken is lightly spiced. Enough to give it a great flavor but nothing overpowering. The thing that I think puts this over the top is the use of fresh bread crumbs. I am so a convert. I won't be using those old, dry boxed ones ever again. Definitely a recipe we'll be making over and over around here. Thanks Deborah! Preheat the oven to 400F. Coat a large baking sheet with cooking spray. Combine the bread crumbs, garlic powder, onion powder, oregano, thyme, paprika, salt and pepper in a shallow dish. Mix well. Dip the chicken strips in to coat evenly, and tap off the excess. Lay the chicken strips on the prepared baking sheet in a single layer. Spray the tops with cooking spray. Cook until golden brown and cooked through, about 20 minutes. In a medium bowl, mash the avocado and sour cream together with a fork. Fold in the jalepeños, lime juice, cilantro and hot sauce, then season to taste with salt and pepper. 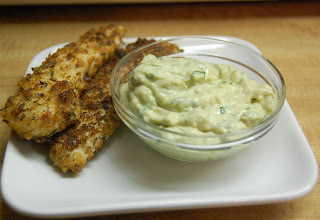 Serve the chicken fingers with the avocado sauce on the side for dipping. *To make whole wheat bread crumbs, take a slice of whole wheat bread and put it into a food processor. Process until it makes fine crumbs. I only needed one slice of bread to make the amount of crumbs needed. Feel free to substitute prepared bread crumbs.